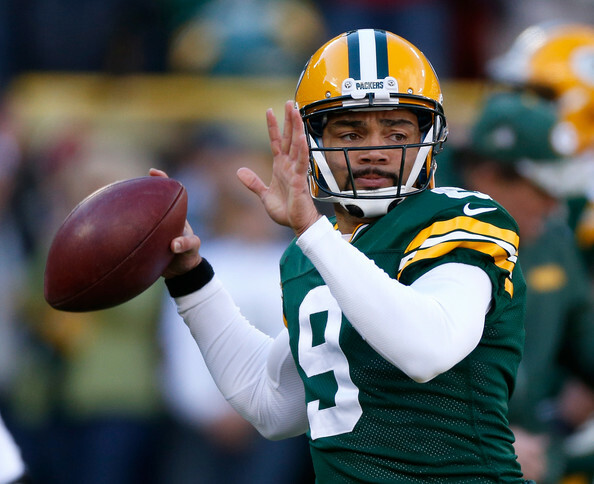 Seneca Wallace has left Sunday’s game against the Philadelphia Eagles with a groin injury. The Packers are already without Aaron Rodgers who suffered a fractured collarbone in Monday’s loss to the Chicago Bears. UPDATE: Seneca Wallace has a groin injury and his return is questionable. Scott Tolzien is in at QB. Scott Tolzien is in to replace Wallace whose return is questionable at best. This is Tolzien’s first appearance in a regular season game. The Packers signed the former Wisconsin Badgers quarterback after he was released by San Francisco at the end of the preseason. Of course if Tolzien does bad he probably does not have to worry about hate mail. After-all it appears no one knows how to spell his name correctly. 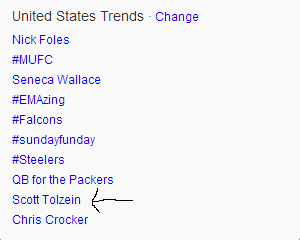 Hint: It’s not Scott Tolzein.